A former Venezuelan prosecutor has accused the government of jailing an opposition leader "because they feared his leadership". Franklin Nieves, who prosecuted Leopoldo Lopez, was speaking on CNN in Miami after leaving Venezuela. He said that Mr Lopez was innocent and the evidence against him was false. Mr Lopez, who led anti-government protests last year, was sentenced in September to almost 14 years in jail for inciting violence. Mr Nieves left Venezuela last week and is reportedly seeking asylum in the United States. Venezuelan Attorney-General Luisa Ortega sacked Mr Nieves on Monday for actions "contrary to his oath of office". On Tuesday, Mr Nieves told Spanish-language news channel CNN en Espanol that "Leopoldo [Lopez] is innocent". 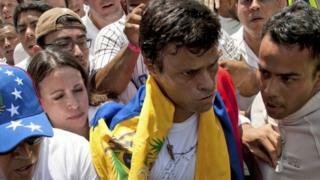 "They jailed him because they fear his leadership," he told CNN's Fernando del Rincon on the programme Conclusiones. Asked if Mr Lopez should be free, the former prosecutor said: "Yes, indeed, because after examining each and every piece of evidence it was shown that this person had at no point made even a single call to violence." Mr Nieves said that video footage taken from protests at which Mr Lopez spoke showed him "always calling on his supporters to remain calm". Mr Lopez handed himself in to the authorities on 18 February amid mass anti-government protests in which 43 people - from both sides of the political divide - were killed. He has always denied inciting violence and his supporters say he is a political prisoner. Asked why he had not spoken out before Mr Lopez was sentenced to 13 years and nine months in prison, Mr Nieves said that he had remained silent "out of fear and because of the pressure exerted by each one of our bosses on prosecutors working at the national level". He then explained that the pressure filtered down from President Nicolas Maduro and National Assembly President Diosdado Cabello through the attorney-general to individual line managers who got prosecutors to act "on the whims" of the authorities. Mr Nieves went on to allege that he was instructed to arrest Mr Lopez to "take him out of the political game" and that the order came from President Maduro. He also alleged that the police report on which Mr Lopez's arrest order was based was "fictitious and invented" and that the witnesses in the case were "false" as they had been told to testify in a certain manner. Mr Nieves also alleged that the case of Mr Lopez was not unique. "There are innumerable cases in which people were investigated and innocent people detained," he told Mr del Rincon. On Monday, Ms Ortega dismissed Mr Nieves' allegations, saying that "at the state prosecutors' office we don't pressure anyone". She added that Mr Nieves had given in to "pressures from foreign and domestic elements" although she did not specify what pressures those were.